End of High Season Special - remaining April 2019 dates for $289/night plus cleaning and tax ($40/night savings). Minimum stay 6 nights. Our elegant fourth-floor condo affords you all the conveniences of home, with all the sun and fun of Hawaii right outside your door! Unlike most owners at Kihei Surfside, our family lives in Kihei and we make a point of checking the condo before your arrival to make sure it is in great condition. You may contact us directly instead of dealing with a busy rental agency! NOTE: the entire Kihei Surfside building is not air-conditioned. We do provide high quality ceiling fans and have additional floor fans available. The warmer summer season is discounted accordingly. The Kihei Surfside complex is known for its gorgeous expanse of lawn, wonderful ocean-front gas barbecues, picnic tables, shuffleboard, and a beautiful heated ocean-front swimming pool. Sunsets are truly a “happening” here. You might find yourself sharing in the traditional Hawaiian ritual of blowing the conch shell to celebrate the close of another day in paradise at the Kihei Surfside. Just steps away from our complex is the start of Keawakapu Beach, one of the most beautiful sandy beaches in south Maui. Here you can enjoy activities including swimming, boogie boarding and snorkeling. Right next to Kihei Surfside is a famous reef where you might meet our favorite turtle, Sebastian, along with his turtle friends, the elusive eels and bright-colored fish among the beautiful coral reefs. You can walk or jog for a mile on this pristine sandy beach, admiring multi-million-dollar private homes and views of the islands of Molokini and Kaho'olawe. Our family had vacationed in Kihei every January since 2004. In 2010 we moved to sunny Kihei. The next logical step for us was to buy a vacation rental that our friends and family can come visit us! We hope to welcome you at Kihei Surfside 405 soon! We are sure you will enjoy your stay! We fell in love with this building, loving the quiet oceanfront location. #405 was listed for sale in September 2010. We looked at the condo, met the former owners, Cynthia & Larry, and fell in love with both the condo but also the way they operated their vacation rental! We went down to the parking lot and started writing up an offer! We are thrilled to carry on their tradition of providing a beautiful vacation condo for our guests! 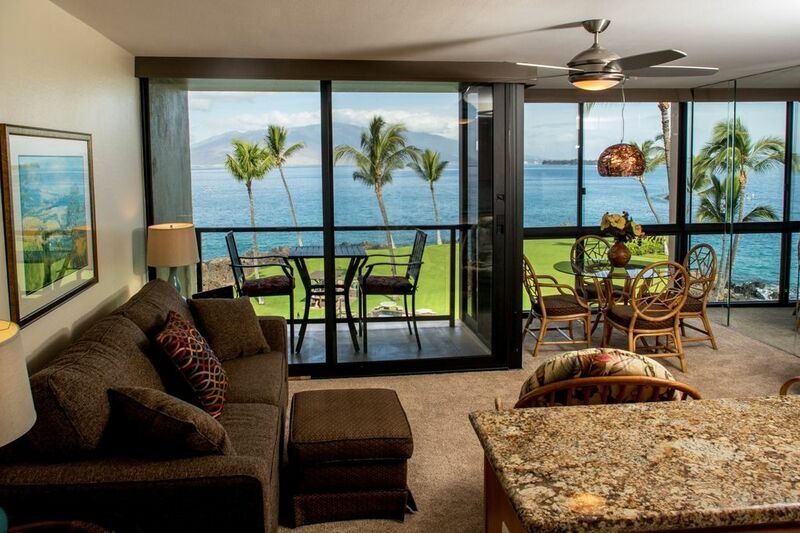 As Maui residents, we take pride in providing you with an elegantly beautiful home away from home! You may contact us directly during your stay, rather than dealing with a busy rental agency! We live just a short 5 minute drive from the condo and are here to handle any concerns. We also own three other condos (in different buildings). Check out our website for more information. no pull-out couch. This condo sleeps 2 people only. We provide spices. Check the cupboard for additional pantry items other guests may have left behind. A small book collection in the hallway cabinet. small DVD library in the condo, more DVDs available to borrow from the front desk. We also have a complimentary Netflix account for you to enjoy. small putting green on property. The Wailea golf courses are close by! It is a very nice and well appointed condo with attention to detail. We especially enjoyed the beach which you can't see from the terrace but it is actually a very close walk. It is also convenient to high end restaurants and other amenities. Sunset was our favorite time with others at the condos blowing conch shells to welcome every sunset. We hated to leave. Beautiful condo, great location. Everything you could want for a fabulous vacation! This place had everything we needed including condiments, coffee, sunscreen, sun burn creme and beach gear. Super impressed with the attention to detail with everything she provided. You can cook what ever you want there. We had a wonderful stay for our honeymoon at Cara’s condo at the Kihei Surfside. The condo is extremely well appointed with a chef’s kitchen and lovely island style furniture, plus all the extras you could possibly need on your visit like beach chairs and a cooler, blankets for Haleakala and even a ‘Road to Hana’ CD. Before our trip we did lots of research to find the best snorkelling-swimming-paddleboarding combination spot on Maui and the Surfside did not disappoint. There was a fantastic rocky reef right outside, easily accessible from the sandy beach next door or the boat ramp, where we snorkelled with sea turtles and colourful fish almost every morning. We enjoyed many sunrises and sunsets from the condo’s lovely lanai - it is possibly one of the best situated in the whole building. A couple of days before our arrival, hurricane Hector was threatening to make landfall in Hawaii, and Cara kindly warned us and stocked us up on water in case there was any problem - thankfully there wasn’t. We couldn’t have asked for a better place to stay - we would recommend this spot wholeheartedly! Beautiful and clean with a gorgeous view. You can tell Cara takes special care of her units. We had everything we needed. Ensure to keep an eye out for the sea turtles as they tend to feed on the algae directly outside the unit! Hawaii tax ID GE/TA-064-787-608-01 ***We accept bookings up to 12 months in advance. Mahalo. *** Christmas/New Years: 10 night minimum stay with no arrivals/departures between Christmas and New Years. CANCELLATION POLICY: More than 60 days: refund deposit less $100 cancellation fee and credit card charges if applicable. VRBO/HomeAway does not refund their service fee. Less than 60 days: no refund.